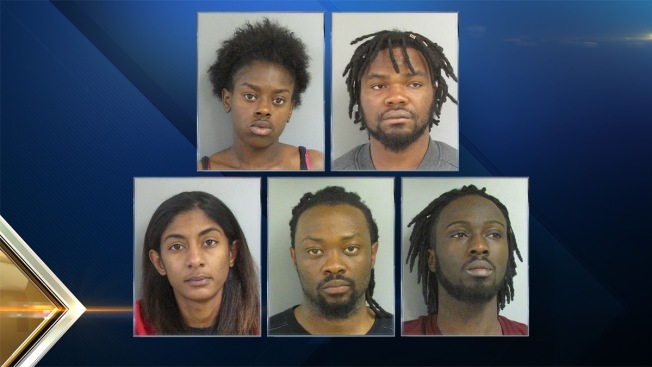 Five people were arrested after counterfeit bills were passed at several Salem, New Hampshire, stores. Clockwise from top left are: Nicole Jackson, Kelvin Jarlee, Helen Nascimento, Prince Zuah and Stephen Wolo. Five people are facing charges after attempting to pass counterfeit bills at three Salem, New Hampshire, stores. Salem Police said they were called to Market Basket on South Broadway around 5:30 p.m. Monday for a report of several subjects attempting to pass counterfeit bills. Upon arrival, police located the suspects and were met by Market Basket managers and employees from Marshalls who said the group had also been in their store passing counterfeit bills. During the course of their investigation, police located two additional suspects who had passed counterfeit bills at Home Depot. Nicole Jackson, 18, of Philadelphia, Pennsylvania, was charged with forgery and theft by deception. Helen Nascimento, 26, of Nashua, was charged with forgery and theft by deception. Stephen Wolo, 25, of Philadelphia, Pennsylvania, was charged with forgery and theft by deception. Prince Zuah, 29, of Philadelphia, Pennsylvania, was charged with forgery, theft by deception and false reports. Kelvin Jarlee, 23, of Philadelphia, Pennsylvania, was charged with forgery, theft by deception, false report, simple assault and two counts of possession of a controlled drug. All five were scheduled to be arraigned on Tuesday in Salem District Court.